4 weeks 9 hours ago. 1 month 9 hours ago. Dolce Suono Ensemble updated their profile picture. Join us Sunday April 28th at 3:00PM for our DSE Presents: The Lure of Paris Concert! Event Link: https://www.facebook.com/events/418633008965014?sfns=mo 1 day 23 hours ago. Come see the premier of a new work by Anna Weesner at our “Lure of Paris” Concert this Sunday! Anna Weesner’s music has received many notable performances, including those by the American Composers Orchestra, Counter)induction, Sequitur, Open End, Network for New Music, Orchestra 2001, the Cypress Quartet, the Cassatt Quartet, Metamorphosen, Ensemble X, Dawn Upshaw, Gilbert Kalish, Richard Goode, Judith Kellock, Scott Kluksdahl, Caroline Stinson and Melia Watras. Weesner was awarded a 2009 Guggenheim Fellowship, a 2008 Academy Award from the American Academy of Arts and Letters, and a 2003 Pew Fellowship. She has been in residence at the MacDowell Colony and the Virginia Center for the Creative Arts. She is Associate Professor at the University of Pennsylvania. Event Link: https://www.facebook.com/events/418633008965014?sfns=mo 2 days 18 hours ago. Broadcast today at noon on WWFM - The Classical Network! DSE's "Irving Fine Tribute Concert" at Brandeis University last season, with Mimi Stillman, Stephen Tavani, and #charlesabramovic, co-hosted by Mimi Stillman and David Osenberg of WWFM. Tune in live or stream at www.wwfm.org! 6 days 22 hours ago. Our last "Rediscoveries: Festival of American Chamber Music" concert featured a special panel discussion so listeners could learn more about the music we performed! You can watch the performance and discussion by accessing the livestream videos on our page! Photos by Pete Checchia 1 week 6 days ago. GOD Bless You. I see you Mimi in Annapolis, MD 2 weeks 5 days ago. 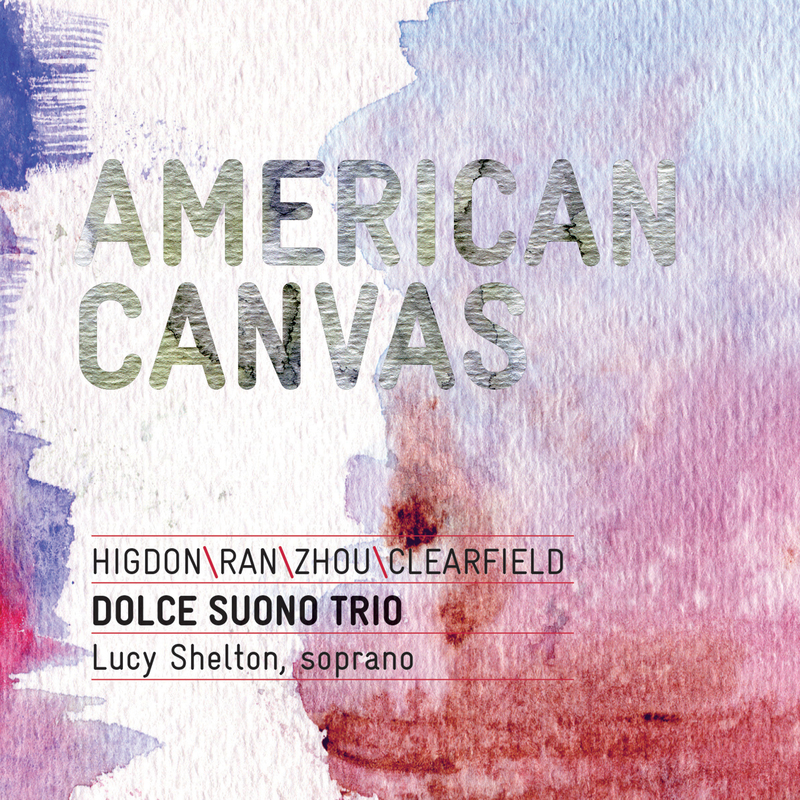 American Canvas is a tour de force of flute, cello, and piano trio repertoire featuring the premiere recordings of four powerful works by some of today’s most celebrated American composers. Pulitzer Prize winners Jennifer Higdon and Shulamit Ran, Andrea Clearfield, and Zhou Tian embrace a variety of sources from visual art, literature, and nature, telling musical stories in a pyrotechnic display of color and brushwork, an eerie nocturne on a lake, a vivid intoxication by the moon, a thrill ride in medieval Spain. The acclaimed Dolce Suono Trio conveys the diverse sonic landscapes, nuanced timbres, and emotional experiences with inimitable virtuosity and passion. The eponymous title derives from Higdon’s American Canvas, a dazzlingly virtuosic show inspired by the art of Georgia O’Keeffe, Andrew Wyeth, and Jackson Pollock. Andrea Clearfield’s Spirit Island depicts the beauty and terrifying power of the natural world inspired by her journey to the Canadian Rockies. Zhou Tian’s Viaje is the composer’s evocation of the Spanish medieval hero El Cid, in which he marries his Chinese-American heritage with his love of Spanish culture. Shulamit Ran’sMoon Songs, a reflection on and companion piece to Schoenberg’s Pierrot lunaire, is a large-scale dramatic work tailored to Lucy Shelton’s unique vocal gifts, with a range of text and music styles from folk to Biblical to contemporary. Dolce Suono Trio, “one of the most dynamic groups in the US “ (The Huffington Post), includes flutist Mimi Stillman (soloist and chamber musician, Yamaha Performing Artist, founding Artistic Director of Dolce Suono Ensemble), cellist Nathan Vickery (New York Philharmonic), and pianist Charles Abramovic (collaborative pianist, Professor at Temple University). Soprano Lucy Shelton and cellists Gabriel Cabezas and Alexis Pia Gerlach complete the album. The trio has enthralled audiences with its programs spanning Haydn trios to its own commissions at prestigious venues including the Philadelphia Chamber Music Society, Smithsonian American Art Museum, New York’s Symphony Space, Brooklyn’s Roulette, Southern Exposure New Music Series (SC), Princeton, Bard, Bryn Mawr, and Cornell Universities.